For Papillon survival was not enough .... he had to be free. Papillon, a prisoner relegated to the squalid confines of a notorious South American penitentiary, maintains he's innocent of the crime for which he's doing time: murder. His cell-mate, Dega, however, is a counterfeiter whose guilt is unquestionable. Though he's a civilized business-type, Dega is easily vitiated by the depraved mores of prison life. As the interned continue to be treated shamefully and subjected to several cruel and unusual punishments, Papillon grows weary of the mistreatment. Misery leads him to attempt a breakout despite the consequences of possible failure. After several unsuccessful endeavors, Papillon finally manages to break out, but not before he's been through hell and back. 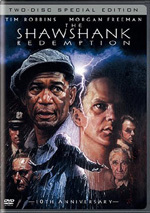 Probably by coincidence, when 1973’s Papillon first hit DVD in 1999, it did so right around the same time 1994’s Shawshank Redemption was released. This seemed notable because the pair both shared quite a few similarities. In addition to their prison settings, most significant is the common theme: the triumph of the human spirit. The main difference between the two stems in how they explore this territory. Shawshank tend to be more of a character drama and veers much more heavily toward the emotional; while the film isn't usually heavy-handed in that regard, it does try to push our sentimental buttons. Papillon, on the other hand, is told in a much more straightforward manner. Director Franklin Schaffner never forces the theme on the viewer; it's demonstrated wholly by the actions of our hero, Henri “Papillon” Charriere (Steve McQueen) as he continually perseveres and survives in the face of overwhelming odds. As such, Schaffner really doesn't pepper us with comments about how overwhelming those odds were. He presents the material coolly and objectively but never inundates the audience with the information, whereas Shawshank is a much "talkier" movie that tends to spell things out for the viewers. The characters of Papillon don't talk - they do. One other interesting difference between the two films concerns their protagonists. Both are jailed for murders they claim they didn't commit. In Shawshank, we learn absolutely whether or not Andy Dufresne pulled the trigger. On the other hand, we never gain any insight into what the truth of Papillon's situation was; the character repeatedly states his innocence, but no evidence ever appears to support that claim. These comments shouldn't be seen as a slam on Shawshank, which I actually prefer as a film. Is it somewhat heavy-handed and sentimental? Yes, but it's also very effective and entertaining. 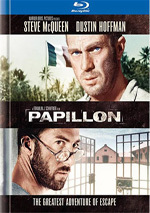 While I admire the objectivity of Papillon, it nonetheless leaves me somewhat cold. I like the movie and think it made for a fairly effective jailbreak picture, but it never really draws me in and gets me involved in its world; I always felt like an outsider as I watched it. Papillon presents a surprisingly strong performance from Steve McQueen. I'm too young to have witnessed much of his work during his lifetime since he died when I was 13; in fact, The Towering Inferno was the only McQueen movie I saw theatrically. As such, I derived an opinion of him through video, and I've generally seen him as a fairly stoic tough guy with little range. I can't say that McQueen deviates greatly from that persona as Papillon, but he provides enough emotional variety to impress me. Well, "emotional" is probably a stretch - he remains pretty stoic throughout the film - but he's able to capture different facets of Papillon's personality nicely and reacts realistically to various situations. Most impressive is the work he offers during Papillon's long stay in solitary confinement; McQueen does a splendid job of depicting the frazzled state into which Papillon entered. Dustin Hoffman’s Dega - Papillon's nerdy little friend – seems less impressive. To be frank, I think Hoffman can be an overrated actor; he sometimes relies on caricatures, and that's his problem here. Dega never seems like an actual person; he's a cartoon, just like Rain Man. Dega would have seemed more real if Hoffman had gone lighter on the funny voice and various tics. One unusual aspect of Papillon - and another reason why the film seems so objective - is its relative lack of a musical score. Oh, it has one – by Jerry Goldsmith, who'd already collaborated with Schaffner on Patton - but it appears very sporadically for much of the film. In fact, it doesn't even enter until about 20 minutes in to the picture; I jumped when the music played because I didn't anticipate it. That piece lasts a few minutes and then we don't hear any more music for about 20 more minutes, when we again encounter a brief bit of score. And so it continues throughout most of the film. The final half an hour of Papillon features the most music; it's still not completely standard at that time, but it's a lot more common. I don't care for this approach because it undermined the usefulness of the music. When we hear the score, it’s so unusual that it stands out like a sore thumb; it’s all I concentrate on at those times. The music should accentuate the action, but it cals too much attention to itself by its relative absence. Schaffner should have either omitted the score altogether or made it more ubiquitous; as it stood, it provides a negative effect on the film. Ultimately I have to give Papillon a mildly positive review. I like the movie and think it tells a compelling story, but the matter of fact way in which it delivers its narrative leaves me a bit cold. While I'm definitely not a fan of films that hammer home their themes, I feel Papillon would have benefited from a warmer approach. Papillon appears in an aspect ratio of approximately 2.35:1 on this Blu-Ray Disc. The movie came with an erratic but generally satisfactory transfer. Sharpness was one of the up and down elements. Though most of the movie demonstrated good clarity and accuracy, occasional soft spots materialized. These tended toward wider shots and weren’t frequent, but they created some distractions. I noticed no issues with jaggies or shimmering, and edge haloes remained absent. The print also lacked any source defects; it came across as clean and showed an appropriate level of grain. Much of Papillon opted for a rather earthy palette, and the hues looked decent within those constraints. Rare instances of brighter colors – usually viewed in flashbacks or dreams – were solid, though the film featured abnormally bright red blood. That was clearly a production decision, but it was a distraction; the blood was downright pink at times! Blacks were reasonably deep and dense, and shadows seemed fine. Low-light sequences occasionally were a smidgen dense, but not to a significant degree, so these shots appeared clear enough. Nothing here stood out as impressive, but it deserved a “B-“. Papillon offered a remixed DTS-HD MA 5.1 soundtrack that was also a mixed bag. For its era, the soundfield seemed pretty good, though. The track occasionally opened up for ambient effects in the side and rear speakers, and a few louder sequences emerged; in particular, storms broadened the spectrum in a reasonable manner. Music also demonstrated very nice stereo presence. Audio quality tended to be erratic. Music easily fared best, as the score appeared vibrant and dynamic; that side of the track barely showed its age. Unfortunately, the other aspects of the mix were less satisfying. Some effects boasted good dimensionality, and a couple scenes – like one in a ship’s boiler room – even tossed out some nice bass. However, most of the effects tended to be a bit thin and flat, and the same qualities affected speech. The lines remained intelligible but lacked much natural tonality. All of this added up to a “B-“ when I factored in the film’s age. Not a lot of extras appear here. We get a period featurette called The Magnificent Rebel that runs 12 minutes, 19 seconds. It includes notes from Henri Charriere, director Franklin Schaffner, director of photography Fred Koenekamp and actor Dustin Hoffman. We get glimpses of the production, with the highlights coming from a tour of the set with Charriere. This is a promotional effort but it’s good for its genre. 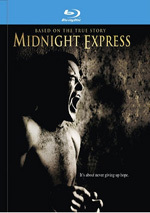 In addition, the package features the film’s theatrical trailer and a hardcover book. This comes as part of the package; open up the disc’s casing and the book appears on the left half. It includes essays called “To Hell and Back: Remembering Papillon” and “Spreading Rugged Wings: Horror and Beauty in Papillon as well as cast/crew biographies, trivia and photos. The book adds a nice capper on the release. Though Papillon provides a good film, it’s not one that I find tremendously involving. The movie seems a little too clinical and objective; while I usually like those tendencies, in this case, they leave me a bit distant from the characters and story. The Blu-ray delivers erratic but acceptable to good picture and audio along with a few minor supplements. This isn’t a great Blu-ray, but it replicates the film in a fairly positive manner.